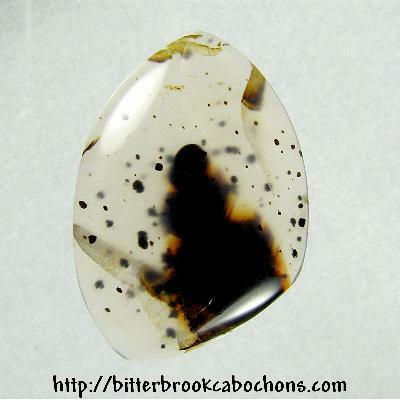 If there was such a thing as black snow, this Montana Agate freeform cabochon would show a snowman in a heavy snowfall. But since there's no such thing as black snow... well, then it doesn't. There are a couple of healed fractures in the stone. This one has saw marks on the back that don't show from the front since the matrix is milky. 32mm x 24mm x 4.5mm. Weight: 25.35 carats. Do you like Montana Agate Cabochons? Click here to see all of the Montana Agate Cabochons on the site!